It started with a dilemma. Back in the early 1940’s Frederick W. Jones was a potato chip distributor with no potato chips to sell. His normal supplier was struggling to keep up with production. The solution came in two parts. Frederick’s supplier gave their blessing to form his own potato chip company. Equally important, his supplier graciously provided much-needed experience, teaching Frederick how to produce excellent potato chips. The Jones Potato Chip Company was born. Frederick cooked his potato chips by hand in a kettle. The chips were lifted out of the hot oil in a basket and spread out on a counter to cool and to be salted. Then the potato chips would be put into wax bags, stapled shut, ready to be put into cartons to be delivered to local stores and restaurants. The wax bags did not protect the chips from light or moisture very well; providing quality potato chips to the customers was a challenge. 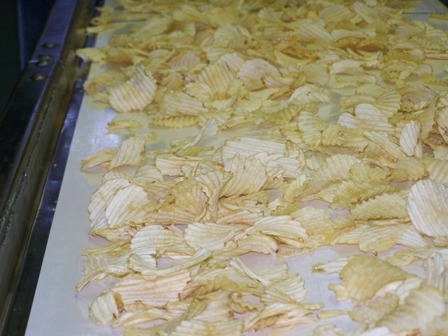 The difficulties in producing a high quality product drove many of the local hometown potato chip companies out of business. The companies that overcame the obstacles to produce good-tasting products thrived. When the Jones Potato Chip Company was created, there were no wavy potato chips in the Mansfield, Ohio, area. From the beginning, Jones Potato Chips used the term “Marcelled” to describe their wavy-style chips. Frederick used this to differentiate his product and get his potato chips into the local stores. Once business was secured, it was essential to keep the customers. Frederick’s willingness to service his stores better than any of his competitors was a critical factor in maintaining the relationship with each customer. Frederick was also determined to make every package of Jones Potato Chips that left his factory of the highest possible quality. Frederick commented, “Stores sell potato chips one package at a time and customers eat potato chips one package at a time.” Frederick wanted each bag sold, each chip savored, to be an enjoyable experience. 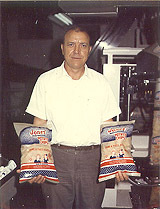 The unique-tasting Jones Potato Chips became a local favorite and the company grew. In order to increase production, pieces of automated equipment were added to the cooking process. By the 1960’s everything from peeling potatoes, slicing, frying, salting, and packaging were fully automated. The Jones Potato Chip Company is truly a family organization. Frederick, his wife Elaine, and all six of their children have worked in the business. Through the years, over forty family members have been employed by the company. Frederick and Elaine Jones retired in 1986. The Jones Potato Chip Company strives to maintain a family atmosphere within the company. Success would not have been possible without the steadfast and loyal effort of many individuals over the years. The hard work and dedication of our employees, both past and present, has contributed greatly to the Jones Potato Chip Company. The potato chip was invented in 1853 by George Crum. Crum was a Native American/African American chef at the Moon Lake Lodge resort in Saratoga Springs, New York, USA. French fries were popular at the restaurant, and one day a diner complained that the fries were too thick. Although Crum made a thinner batch, the customer was still unsatisfied. Crum finally made fries that were too thin to eat with a fork, hoping to annoy the extremely fussy customer. The customer, surprisingly enough, was happy – and potato chips were invented! Crum’s chips were originally called Saratoga Chips and potato crunches. They were soon packaged and sold in New England – Crum later opened his own restaurant. William Tappendon manufactured and marketed the chips in Cleveland, Ohio, in 1895. In the 1920s, a salesman named Herman Lay sold potato chips to the southern USA (selling the chips from the trunk of his car). In 1926, Laura Scudder (who owned a potato chip factory in Monterey Park, California) invented a wax paper potato chip bag to keep the chips fresh and crunchy. With further technology, innovation, and a countless number of variations and flavors, potato chips have only grown in popularity over the years!